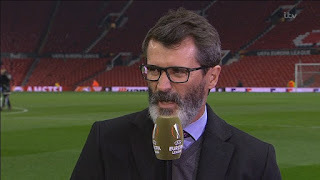 Manchester United legend Roy Keane has questioned the attitude and ‘character’ of players currently at his old club claiming it seems they’re not proud of the red shirt. United played out a 1-1 draw with Liverpool at Old Trafford on Thursday night which saw them exit the Europa League at the last-16 stage and the 20-time English champions still face a fight to finish in the Premier League top four and an FA Cup replay with West Ham United. However, Keane, who was analysing the game alongside legendary Red Devils midfielder Paul Scholes on ITV said there’s a massive contrast between United players of now and in the past when players used to feel ’10 foot’ taller whenever they pull on the club’s jersey. “I’m saddened by what I’ve seen from United over the last year or two. It’s like a bunch of strangers have been thrown together,” the 44-year-old Hibernian, who won seven top-flight titles with United under Sir Alex Ferguson in the 90s said. “When you play for Man United and you put that jersey on, I always felt 10 foot tall but some of these players look like they’re shrinking with the jersey on. “If you’re playing for Man United, you’ve got to deal with that pressure and that expectation. This group of players is certainly struggling. I know they’ve had injuries and it goes to show how important and fit Wayne Rooney is to this club.